Oh Mark, If you expect newspaper articles to be accurate, well researched and truthful, they would all go out of business. They're in the business of selling ink for a profit. They just went with a story that would keep people reading the paragraph further along without switching over to the comics page. I am sure most of these newspaper guys had their start in tabloid trash papers writing about "Two headed alien sasquatch family living in the Pine Barrens".
" 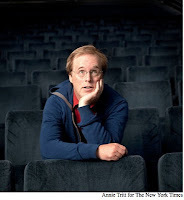 Brad Bird is the first Transylvanian vampire teenager turned motion-capture cartoonist to make it to Hollywood after stepping out of the bus from his home town of Omaha, Nebraska to become THE first live action director and transgender to film Tom Cruise on the CN Tower in Durban using only an iPhone." Rubbish, but it kept you reading. The lack of research by the author of the N.Y. Times piece is appalling. This is not hidden, difficult to find information. And add to your list of former animators who became live-action directors: David Swift . Basic Point: Almost every time that one reads an article or watches a presentation by a “journalist” on an area in which one has some real expertise, one is going to see that the coverage is filled with some combination of misinformation and of dysinformation. The thing to take away from this experience is that when one is reading articles or watching presentations by journalists on areas where one lacks expertise, these are almost certainly going to be filled with some combination of misinformation and of dysinformation. Do not accept what you are told. everyone is unaware of fred dachau. It's best that way. Hi my name is Tom Sanders and I am a freelance animator in London, England. I graduated in 2009 and did the whole travelling thing the year after and for the last 7 months I have been starting out as a 2D animation freelancer. I have had a few bits of work here and there working for big companies such as IKEA and Nokia, doing mainly internet commercials and corporates. My main aim is to work within the childrens industry, creating and producing cartoons for television and film. Obviously this is hard what with the current lack of tax breaks for the animation industry. However I am very positive that I will succeed and am always trying my hardest to improve my animation and build up both my contacts and skill base. Bill Plympton directed three or so LA films as well. Bill cites that they were not as successful as his animated shorts and was too expensive, so he decided to give up on that. I guess there is no love here for Mike Judge (Beavis and Butthead, King of the hill) and his 3 live action films, 2 of them became cult classics: Office Space and Idiocracy. Interestingly, among the people commenting in the comments section is Rob Minkoff. I'm glad that the author is being schooled by people like David Nethery and Rob Minkoff. The article is just plain wrong and the author is trying to weasel his way out of sloppy work by redefining his standard after the fact. Can we count live-action people who switched to animation? That's what happened with Trey Parker and Matt Stone. They originally aspired to be live-action directors and got couple of films distributed before they gained success with "South Park"
Burton and Disney don't count. Do you know why?